General Description: It is a submersed, rooted aquatic plant, having both submerged and emergent leaves growing from a stout stem up to .18 inches in diameter and 3.25 feet in length. Flower Description: The infloresence is a spike 1.9 to 13.8 inches long consisting of flowers in whorls of four. Flowers have four stamens, and petals are 0.06 to 0.12 inches. Leaf Description: Emergent spikes are 2 to 6 inches long with persistent, lance shaped to oblong leaves. It has prominently serrated bracts that are reflexed, extend past the flowers. Submerged leaves are whorled and dissected, feather-like, with 7 to 11 leaflets. Stem Description: Stems are dark red to reddish-brown. It’s an invasive plant that can alter aquatic ecosystems. It forms mats that shade out native plants and inhibits water flow and recreational activities. 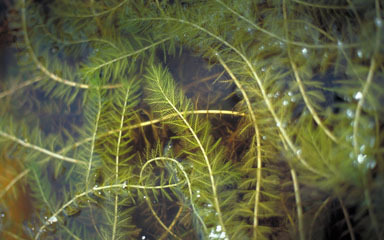 It may be able to hybridize with the native watermilfoil resulting in a more aggressive hybrid.